Yum! I love Chinese food! This dish was amazing and even gives my favorite Chinese food restaurant a run for their money. Heat a wok or large skillet over medium-high heat. Pour in 1 1/2 Tablespoons sesame oil. Once the oil is hot, add the garlic and red pepper flakes, stir frying for about 30 seconds. Add the broccoli and 4 Tablespoons chicken broth. Cook for about 2 minutes, stirring constantly until they turn a brighter green. Reserve the broccoli on a plate. Heat the remaining sesame oil in the skillet. Add the chicken and season with salt and pepper. Stir fry for 3-5 minutes to fully cook the chicken. In a small bowl, combine the remaining chicken broth, oyster sauce and hoisin sauce. Pour this mixture into the skillet along with the broccoli and green onions. 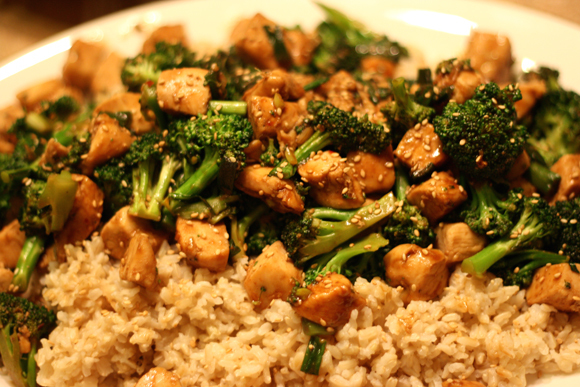 Serve over brown rice and garnish with sesame seeds. We enjoyed this recipe but thought it was a bit salty. Most likely from the fish sauce so next time I will reduce that by half.